Love Abide [J1472] - $14.00 : Yarn Tree, Your wholesale source for cross stitch supplies. Cross Stitch pattern from La-D-Da. What a beautiful design for a new homeowner or to stitch for your own home. 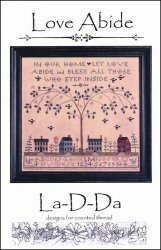 "Love Abide," features the saying, "In our home let love abide and bless all those who step inside," stitched at the top. A street with houses is stitched below, with a tree growing between a couple of the houses. Below the houses, the alphabet is stitched with the number 1-10. Stitch count 254w x 243h.